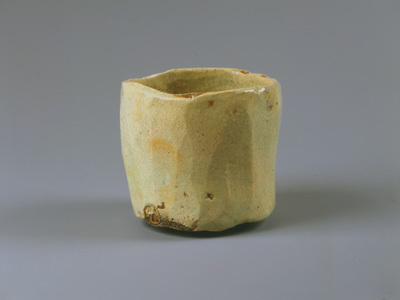 This piece is not after Kôetsu's tea bowl but is an interpretation of what Kôetsu's tea bowls represent. 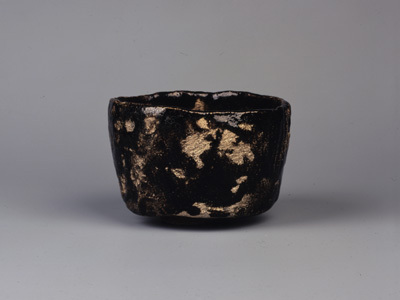 Ryônyû's artifice is evident particularly in high command of trimming and the way the black glaze is applied. 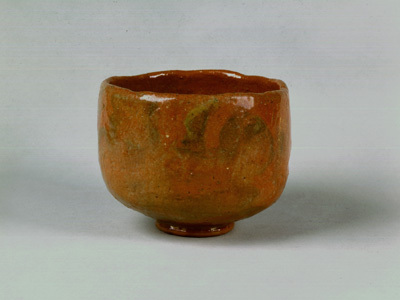 This red tea bowl with a soft contour is among a series of 200 red tea bowls produced by Ryônyû. They were all named by Sottakusai, the 8th head of the Omote Senke school of tea. “Obasute” is the name associated with the moonlight over the Obasute Mountain that purifies the soul of an old woman. Taking the trimming technique to the best advantage had been Ryônyû's pursuit of individual expression since his early age. His trimming here became even bolder to the supreme. The piece reveals Ryônyû's innovative style developed after his retirement.